It doesn’t matter if you’ve eaten basil in a creamy pesto drizzled over pasta at your favorite Italian restaurant, or devoured the herb in a delicious Vietnamese Pho – you’ll be experiencing amazingly tasteful health benefits either way. Used for centuries and having its own mythology and folklore due to its numerous royal qualities, sweet basil is a must-have in any kitchen. Basil means ‘king’ in the Greek language, and it is often used in Holy water since it was considered to grow in the same spot that St. Constantine and Helen founded the Holy Cross. In Mexico it is kept in the pocket to entice a long-lost lover back home after an extended journey. In Romania, basil is given to a fiancé to declare love and start an engagement. The plant’s history may just be more interesting than the benefits it provides. 1. Basil offers 60% of your daily recommended dose of vitamin K, which helps bones and the heart to be strong. Vitamin K is also essential for the proper formation and full activation of the Gla proteins. The Gla protein osteocalcin, when fully carboxylated by vitamin K, allows for the binding of calcium to the bone matrix. 2. Holy Basil, which grows all over India might just be another answer to defluoridating water in poor countries all over the world. Research scientists at Rajasthan University have discovered that Tulsi (holy basil) can replace some of the more expensive alternatives to fluoride removal. 3. Basil contains high levels of zeaxanthin, a flavonoid carotenoid compound that can be selectively absorbed into the retinal macula lutea (a part of the eye) where it was found to filter harmful UV rays from reaching the retina. Studies suggest that common herbs, fruits, and vegetables that are rich in zeaxanthin help to protect from age-related macular disease (AMRD), especially in the elderly. 4. Unique water soluble flavonoids in basil, called orientin and vicenin protect our cells. Especially the white blood cells are positively affected, enduring radiation and oxygen-based damage more easily with the use of basil. 5. Basil is full of iron, the important mineral that helps to move oxygen through the body via the red blood cells. Just 100 grams (a handful of leaves) can supply up to 18% RDA of iron. 6. Basil protects against ‘bad’ bacteria. This is due to the volatile oils is basil: estragole, linalool, cineole, eugenol, sabinene, myrcene, and limonene. Basil can wipe out things like Listeria monocytogenes, Staphylococcus aureus, and Escherichia coli. 7. Basil is full of vitamin A. This important nutrient has been shown to reduce certain types of cancers and aid vision. Basil, native to Asia, grows easily in containers in your kitchen or in a sunny spot in your outdoor garden. 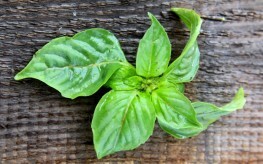 Try planting your own organic basil it purchase it from trusted non-GMO growers. These article tyically never tell you how much of the ingredient you need for the positive effects. I am sitting here thinking, yea Basil is good for you but if I have to eat a pound of it a day to get the nutritional effects then the subject is really mote. If you engaged your brain, you would see that there are links regarding the studies and amounts used.